They mark a host of important events like anniversaries, wedding, and engagements. They are the number one go to accessories when it comes to adding flair and style to your wardrobe. They are the first love of every woman’s life. Yes, you have guessed it right. We are indeed talking about rings. There is no doubt that rings are special. But having said that, no one likes a ring that is not sized properly. If you have an undersized ring, then the everyday struggle to slip it on and off your fingers might leave your frustrated. On the contrary, you might be constantly worried about losing your precious baby if it is oversized. Hence, choosing a ring that perfectly fits the finger is extremely important. So, while you prepare to buy a ring online, it is vital that you take care of this important aspect that is your ring size. And guess what, measuring your ring size yourself it is not as difficult as you might have imagined. In fact, it is very easy. Don’t believe us? Read on to be surprised! 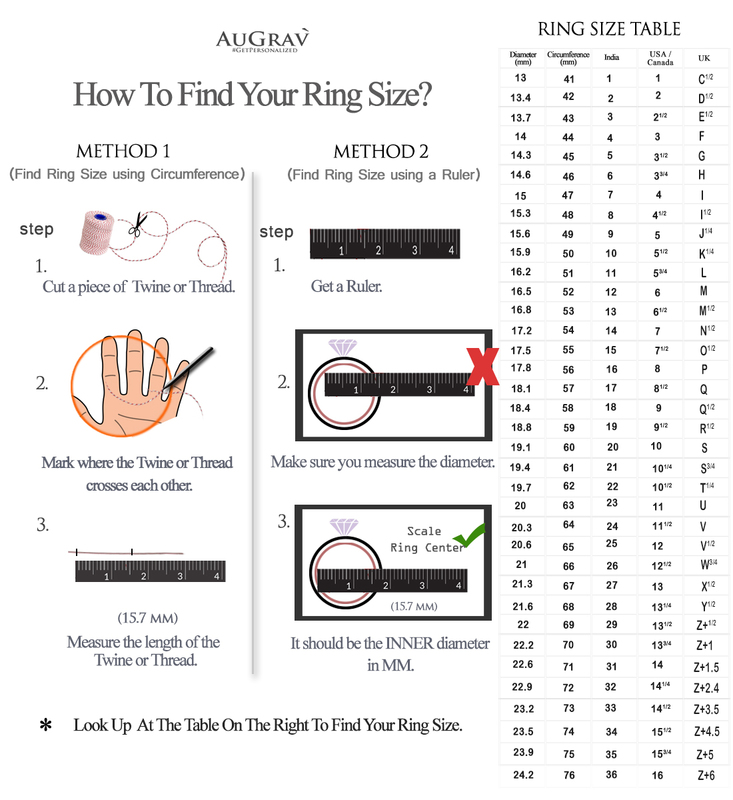 The image below shows two methods by which you can measure your ring size. Both of these are easy and can be performed by anyone from the comfort of his/her home. The idea here is to measure the circumference of the finger at the place where the ring is going to sit. So, cut a piece of thread and ensure that it is long enough to wrap itself around the finger. Now, wrap it around the finger just above the knuckle. Mark the spot where the thread meets itself at the first wrap. 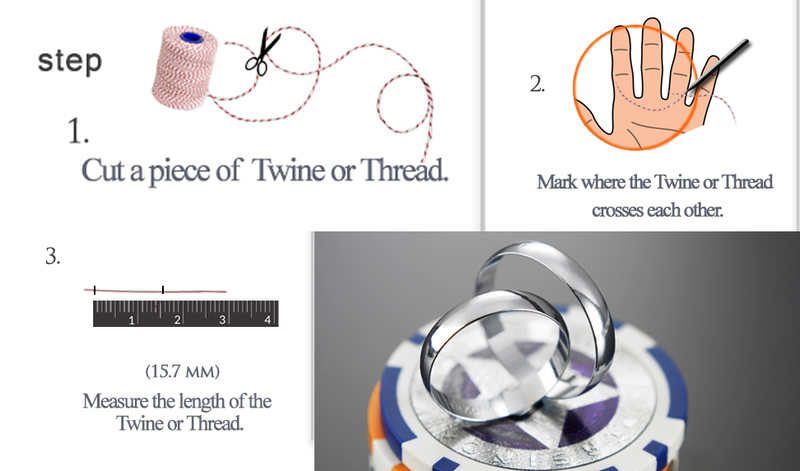 The length from beginning of the thread to the marked spot will determine your ring size. Use the ruler to measure this length in millimeters. 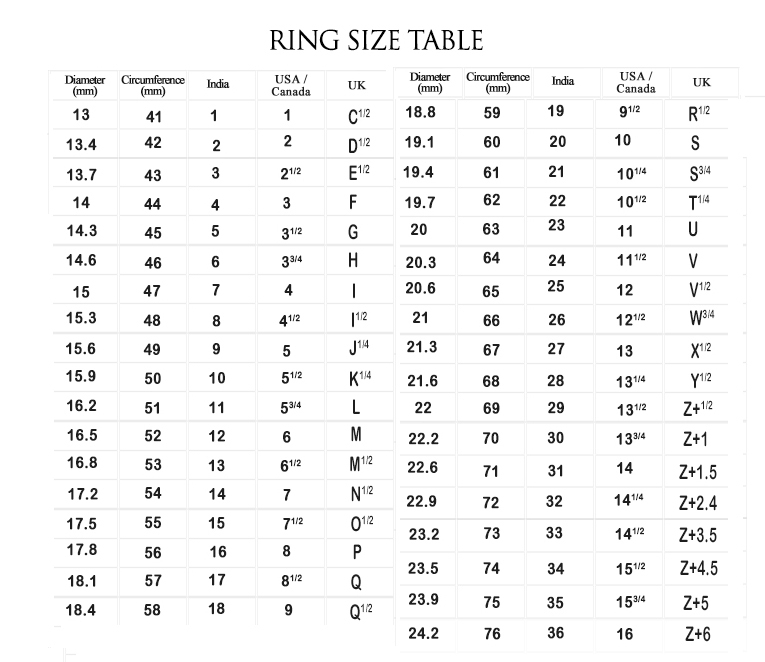 Map this length to the circumference column in our ring size table shown in the image and the corresponding value in the India column will be your ring size! 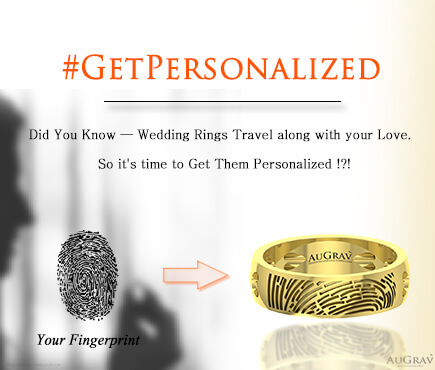 If you have already got a ring that fits perfectly, then it is best to use that ring to measure your ring size. The idea here is to measure the diameter of the ring. Place the ring on the ruler in such a way that the diameter of the ring overlaps the edge of the ruler perfectly. Now measure the INNER diameter of the ring in millimeters. Map this diameter to the diameter column in our ring size table and the corresponding value under the India column would be your ring size. A ring is going to be an important investment both emotionally and economically. Hence make sure that you buy one that best suits your needs and dimensions. 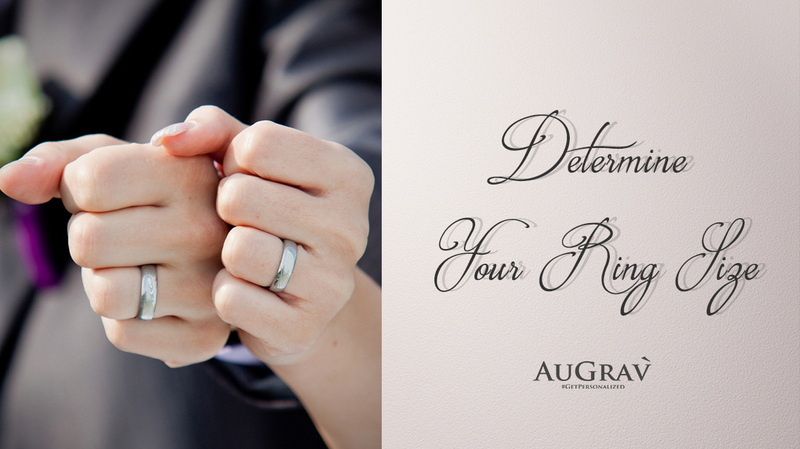 Here are few dos and don’ts that you should consider while measuring your ring size at home. 1.The time at which you measure your ring size could be crucial. During cold temperatures the fingers tend to shrink. And if you choose this time for the measurement, then the chances of getting an erroneous number is high. So, make sure you measure the ring size in warm temperatures. Also doing it towards the end of the day is another best practice. 2.It is better to err on the higher side. So, what does this mean? It is important to understand that it is much easier to resize an oversized ring than to enlarge an undersized ring. So, while measuring your ring size, if there is any confusion, it is always advisable to make an error on the higher side. In this way the ring could be easily resized later. 3.There might be cases when your ring size falls between two values. In these cases, just like in the above scenario, you should go for the higher of the two values. 4.Make sure that you take this measurement 3-4 times. This will help you eliminate the errors if any. 5.If you are pregnant, there are chances that your finger might be slightly swollen. The same is the case if you are on certain medications. Make sure that you also take these factors into considerations. 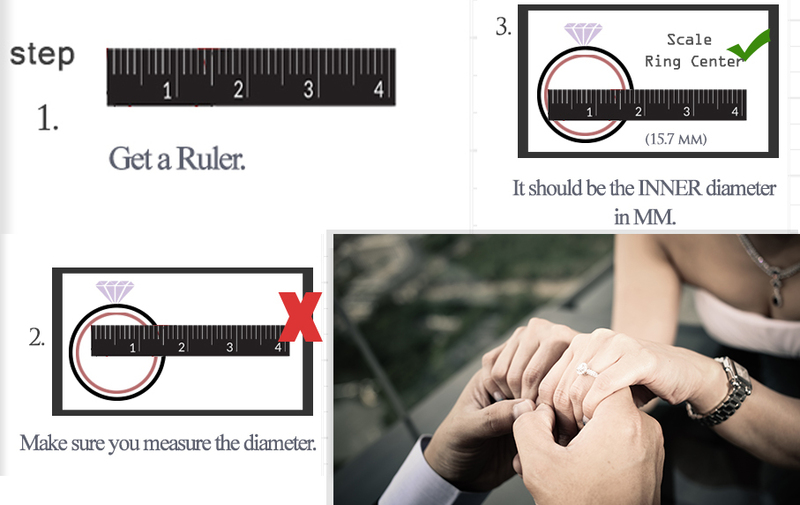 6.If you want to know the ring size of your partner without him or her knowing about it, then check out our blog post – how to measure your partner’s ring size without them knowing about it. 7.Finally, a professional jeweler is someone who knows the craft in and out. Hence, if you have doubts around these procedures and are not confident enough, you can always approach your nearby jeweler and get your ring size checked. As the age old saying goes, better safe than sorry! « Are the Olympics Gold Medals Really Made of Gold? MEASURING YOUR RING SIZE AT HOME: IT IS MUCH EASIER THAN YOU HAVE IMAGINED Overall rating: 4.7 out of 5 based on 235 reviews.